Anteroposterior chest radiograph shows interstitial and alveolar pulmonary edema. Anteroposterior chest radiograph shows bilateral alveolar opacities in a patient with subarachnoid hemorrhage who developed neurogenic pulmonary edema. 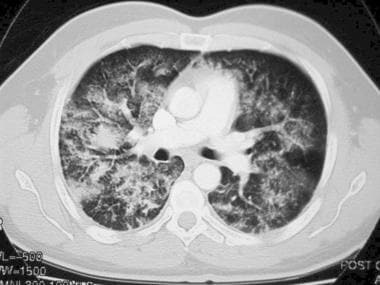 Axial, contrast-enhanced computed tomography (CT) scan shows alveolar and interstitial pulmonary edema. An initial and rapid increase in pulmonary vascular pressure due to pulmonary vasoconstriction or pulmonary blood flow can lead to pulmonary microvascular injury. An increase in vascular permeability consequently results in edema formation, as suggested by the frequent observation of pulmonary hemorrhage in NPE (ie, the blast theory). Two major components contribute to the pathogenesis of NPE: elevated intravascular pressure and pulmonary capillary leak. Therefore, hemodynamic cardiogenic and noncardiogenic components exist. These components often work in concert, as in pulmonary edema after epileptic convulsions or intracranial pressure elevation. The hemodynamic component is relatively brief and may unmask pure NPE, such as that seen in experimental seizures. Whether the hemodynamic changes produce a pulmonary capillary leak through pressure-induced mechanical injury to the pulmonary capillaries or whether some direct nervous system control over pulmonary capillary permeability exists remains uncertain. The neuro-effector site for nervous system–induced pulmonary edema appears to be relatively well established in regions about the caudal medulla, where nuclei regulating systemic arterial pressure, as well as afferent and efferent pathways to and from the lungs, are located. To avoid life-threatening complications, prompt recognition of NPE is important. The use of chest radiography and other tests is key to establishing the diagnosis and to distinguishing between the 2 types of pulmonary edema. The heart is usually enlarged in cardiogenic pulmonary edema, but it may be normal in lung injury and NPE. However, the heart may also be of normal size in cardiogenic edema after acute myocardial infarction. Pulmonary vascular plethora often occurs with upper lobe blood diversion in cardiogenic cases; vessels of the upper lobe are balanced to cephalic in fluid overload but are normal in lung injury. Pleural effusion may be seen in all 3 causes. Septal lines indicative of interstitial edema are more frequent with cardiogenic causes than with others. The infiltrates of cardiogenic pulmonary edema are usually diffuse, and air bronchograms are rare. Infiltrates in nephrogenic pulmonary edema are classically described as having a bat-wing distribution, whereas those in lung injury tend to be more peripheral. Although the peripheral infiltrate is fairly specific for lung injury, the diffuse variety is seen with equal frequency in lung injury. The presence of air bronchograms is also fairly specific for lung injury. One of 3 patterns is seen: a normal chest, bilateral perihilar pulmonary edema, or generalized pulmonary edema. 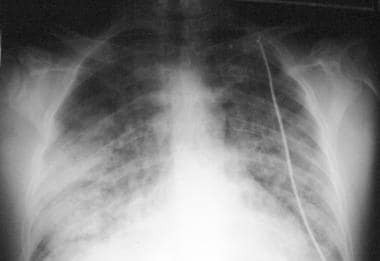 The early signs of pulmonary edema (interstitial edema) are the septal lines (Kerley B lines), which are horizontal lines seen laterally in the lower zones. The septal lines arise from the pleural surface and are typically 1 mm thick and 10 mm long; unlike blood vessels, these reach the edge of the lung. As the edema progresses, alveolar edema is observed in a butterfly pattern characterized by the central predominance of shadows, with a clear zone at periphery lobes. Another feature that may be seen is cardiac enlargement, in cases of previous cardiac failure. In its initial stages, ARDS may resemble cardiac pulmonary edema. However, over the course of 24-48 hours following the onset of tachypnea, dyspnea, and hypoxia, ARDS becomes more widespread and uniform. A useful characteristic for differentiating cardiac pulmonary edema from NPE, as well as from pneumonia and other widespread exudates, is the amount of time it takes for the edema to develop and to vanish. If substantial improvement occurs within 24 hours, this is virtually diagnostic of cardiac pulmonary edema. NPE is a known complication of lung transplantation. [5, 6] Herman and colleagues, however, found chest radiography to be helpful, but not definitive, in distinguishing problems after bilateral lung transplantation and found CT scanning to be excellent for the demonstration of airway problems. In their study, the authors reviewed the postoperative chest radiographic and CT scan findings in 13 patients who underwent bilateral lung transplantation. Portable chest radiography was performed daily for about 10 days, after which upright posteroanterior studies were performed daily for about 10 days and then as clinically required. CT scanning was performed when a complication was suspected. The reimplantation response (NPE due to ischemia, trauma, denervation, and lymphatic interruption) occurred in 12 patients and usually consisted of bilateral perihilar and basal consolidation. Twelve episodes of acute rejection, an imprecise clinical diagnosis, occurred in 10 patients. Radiographic changes consisted of bibasal (N=2) and right middle and lower (N=2) or left basal consolidation (N=1); no changes were observed in 7 episodes. Following the intravenous administration of steroids, radiographic resolution occurred in 4 cases. Radiographic findings associated with the reimplantation response and rejection were nonspecific and were mimicked by fluid overload and infection. Bronchial dehiscence and/or stricture formation occurred in 7 patients. In general, chest radiography was inaccurate in the assessment of these complications, and CT scanning was accurate in such assessments. Conventional chest radiographs are universally available. The cause of the pulmonary edema can be determined with a high degree of accuracy by paying careful attention to certain radiographic features. Milne and colleagues conducted an independent, 2-observer study of 216 chest radiographs in 61 patients with cardiac disease, 30 with renal failure or overhydration, and 28 with capillary permeability edema. They identified 3 principal and 7 ancillary features; all of these were statistically significant and, in a large percentage of cases, allowed accurate determination of the cause of edema. The 3 principal features found were the distribution of pulmonary flow, the distribution of pulmonary edema, and the width of the vascular pedicle. The ancillary features were pulmonary blood volume, peribronchial cuffing, septal lines, pleural effusions, air bronchograms, lung volume, and cardiac size. Differing constellations of these features, each characteristic of a specific type of edema, were found. Overall accuracy of diagnosis in the Milne study was in the range of 86-89%. The highest accuracy was obtained in distinguishing capillary permeability edema from all other varieties (91%). The lowest accuracy (81%) was obtained in distinguishing chronic cardiac failure from renal failure. A study by Liebman et al indicated that it is hazardous to accept a portable radiographic diagnosis of congestive heart failure as a cause of pulmonary edema. In their report, the authors assessed the usefulness of portable chest radiographs in defining the amount of physiologic shunting and the severity of NPE. [9, 10] Of the 11 patients, 10 had acute respiratory failure. Radiographic assessment of the amount of pulmonary edema and the severity of left ventricular failure was compared with the physiologic shunt fraction, tracer-measured lung water, and pulmonary arterial wedge pressure. The radiographic scores for edema were not predictive for the shunt fraction or for the tracer-measured lung water. The radiographic score for congestive heart failure was correlated with the wedge pressure but not well enough to be clinically useful. About 5% of the radiographs were false positive, and 11% were false negative. Radiographic findings lagged behind physiologic derangements. Therefore, the radiographic findings were predictive for the shunt value of the preceding day. Tagliabue and colleagues reviewed the findings of 74 patients with ARDS who underwent chest CT scanning. Lung opacities were bilateral in almost all patients and in most cases (86%) were dependent. The opacities were patchy (42%), homogeneous (23%), ground glass (8%), or mixed (27%). Opacities prevailed in basal regions (68%), in comparison with hilar and apical ones. Air bronchograms were frequently seen in areas of consolidation (89%). In contrast to previous reports, pleural effusion was a frequent finding (50%) that did not worsen the patients' prognoses. Often, loculated pneumothorax (32%) was mostly anteromedial. Ineffective position of thoracostomy tubes was detected on CT scans in 13 of 20 patients. Pulmonary air cysts (30%), always multiple and mostly bilateral, were associated with a mortality rate (55%) higher than that of the whole study group (35%). Compared with chest radiography, CT scanning often yielded additional information (66%), with direct influence on patient treatment in 22% of cases. Stark and colleagues described the CT scan features of 28 patients with ARDS. Diffuse lung consolidation, lobar or segmental disease, and multifocal, patchy involvement were observed. Large lung cysts and small cysts producing a Swiss-cheese appearance of the parenchyma were detected. These findings were not regularly appreciated on chest radiographs. The overall mortality was 72.7%. Patients with lung cysts had a trend toward higher mortality (87.5%). Other unexpected findings were basilar lung abscesses and empyema. In 15 patients, CT scans provided additional information that was not obvious on bedside chest radiographs and led to a change in care for 5 patients. Research indicates that a variety of nuclear imaging techniques can be used to diagnose NPE. Raijmakers and co-investigators concluded that a 67Ga pulmonary leak index can be used in distinguishing ARDS from hydrostatic pulmonary edema. In their study, the investigators examined the effectiveness of a noninvasive, bedside, dual-radionuclide method (67Ga circulating transferrin and technetium-99m [99mTc]–labeled RBCs) of measuring pulmonary microvascular permeability to differentiate between hydrostatic pulmonary edema and pulmonary edema due to ARDS. Patients in the study suffered from respiratory insufficiency and bilateral, alveolar pulmonary edema, as demonstrated on chest radiographs. All but one of the patients were mechanically ventilated. In the Ragimakers et al study, the 2 radionuclides were used to calculate the pulmonary leak index. With various definitions, a supranormal pulmonary leak index for ARDS had a sensitivity of 100%, while its specificity ranged from 46 to 75%. On receiver operating characteristic curves, the pulmonary leak index performed best when ARDS and hydrostatic pulmonary edema were defined only on the basis of risk factors. The index was better than hemodynamic measures, and its performance equaled that of ventilatory variables in discriminating between edema types (if definitions were based primarily on hemodynamic and ventilatory variables, respectively). Iodine-123 meta-iodobenzylguanidine (MIBG) results can be considered indicators of pulmonary endothelial cell function. Jiwa N, Sheth H, Silverman R. Naloxone-Induced Non-Cardiogenic Pulmonary Edema: A Case Report. Drug Saf Case Rep. 2018 May 10. 5 (1):20. [Medline]. Marik PE, Long A. ARDS complicating pustular psoriasis: treatment with low-dose corticosteroids, vitamin C and thiamine. BMJ Case Rep. 2018 Feb 2. 2018:[Medline]. Ono Y, Morifusa M, Ikeda S, Kunishige C, Tohma Y. 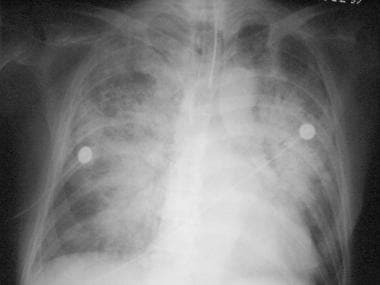 A case of non-cardiogenic pulmonary edema provoked by intravenous acetazolamide. Acute Med Surg. 2017 Jul. 4 (3):349-352. [Medline]. Pesenti A, Musch G, Lichtenstein D, Mojoli F, Amato MBP, Cinnella G, et al. Imaging in acute respiratory distress syndrome. Intensive Care Med. 2016 May. 42 (5):686-698. [Medline]. Garg K, Zamora MR, Tuder R, et al. Lung transplantation: indications, donor and recipient selection, and imaging of complications. Radiographics. 1996 Mar. 16(2):355-67. [Medline]. O'Donovan PB. Imaging of complications of lung transplantation. Radiographics. 1993 Jul. 13(4):787-96. [Medline]. [Full Text]. Herman SJ, Weisbrod GL, Weisbrod L, et al. Chest radiographic findings after bilateral lung transplantation. AJR Am J Roentgenol. 1989 Dec. 153(6):1181-5. [Medline]. Milne EN, Pistolesi M, Miniati M, et al. The radiologic distinction of cardiogenic and noncardiogenic edema. AJR Am J Roentgenol. 1985 May. 144(5):879-94. [Medline]. [Full Text]. Liebman PR, Philips E, Weisel R, et al. Limitations of portable roentgenography of the chest in patients with acute respiratory failure. Surg Gynecol Obstet. 1978 May. 146(5):705-8. [Medline]. Liebman PR, Philips E, Weisel R, et al. Diagnostic value of the portable chest x-ray technic in pulmonary edema. Am J Surg. 1978 Apr. 135(4):604-6. [Medline]. Goodman LR, Fumagalli R, Tagliabue P, et al. Adult respiratory distress syndrome due to pulmonary and extrapulmonary causes: CT, clinical, and functional correlations. Radiology. 1999 Nov. 213(2):545-52. [Medline]. [Full Text]. Tagliabue M, Casella TC, Zincone GE, et al. CT and chest radiography in the evaluation of adult respiratory distress syndrome. Acta Radiol. 1994 May. 35(3):230-4. [Medline]. Gattinoni L, Presenti A, Torresin A, et al. Adult respiratory distress syndrome profiles by computed tomography. J Thorac Imaging. 1986 Jul. 1(3):25-30. [Medline]. Stark P, Greene R, Kott MM, et al. CT-findings in ARDS. Radiologe. 1987 Aug. 27(8):367-9. [Medline]. Feletti F, Mucci V, Aliverti A. Chest Ultrasonography in Modern Day Extreme Settings: From Military Setting and Natural Disasters to Space Flights and Extreme Sports. Can Respir J. 2018. 2018:8739704. [Medline]. [Full Text]. Lichtenstein D. Novel approaches to ultrasonography of the lung and pleural space: where are we now?. Breathe (Sheff). 2017 Jun. 13 (2):100-111. [Medline]. [Full Text]. Al-Sofiani M, Nikolla D, Metta VV. Hypothyroidism and non-cardiogenic pulmonary edema: are we missing something here?. Endocrinol Diabetes Metab Case Rep. 2015. 2015:150014. [Medline]. Raijmakers PG, Groeneveld AB, Teule GJ, et al. Diagnostic value of the gallium-67 pulmonary leak index in pulmonary edema. J Nucl Med. 1996 Aug. 37(8):1316-22. [Medline]. Chen DL, Schuster DP. Positron emission tomography with [18F]fluorodeoxyglucose to evaluate neutrophil kinetics during acute lung injury. Am J Physiol Lung Cell Mol Physiol. 2004 Apr. 286(4):L834-40. [Medline]. [Full Text]. Koizumi T, Kubo K, Hanaoka M, et al. Serial scintigraphic assessment of iodine-123 metaiodobenzylguanidine lung uptake in a patient with high-altitude pulmonary edema. Chest. 1999 Oct. 116(4):1129-31. [Medline]. [Full Text]. Korzeniewski K, Nitsch-Osuch A, Guzek A, Juszczak D. High altitude pulmonary edema in mountain climbers. Respir Physiol Neurobiol. 2015 Apr. 209:33-8. [Medline]. Demirhan A, Yasar Tekelioglu U, Akkaya A, Dagistan E, Suzi Ayhan S, Ozturk S. Magnetic resonance imaging contrast agent related pulmonary edema: a case report. Eur Rev Med Pharmacol Sci. 2012 Oct. 16 Suppl 4:110-2. [Medline].